This yukata features a classic Japanese bamboo and sparrow pattern. Set against a cream background, bamboo is highlighted with gilded accents of green, brown and charcoal gray. Richly detailed, this Japanese yukata is made of 100% shrink resistant cotton. A matching belt is included. 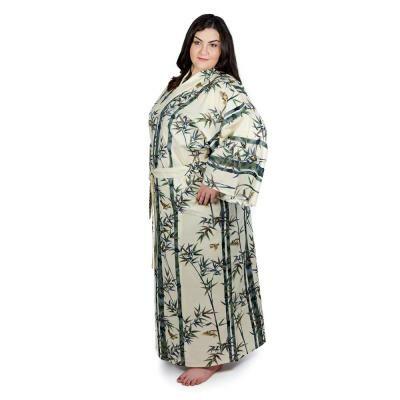 This women's yukata is available in four sizes: Small, Medium, Medium/Wide and Large. Small, measures 54" in length and is designed to fit a woman 5' 2" to 5' 4" in height. The sleeve length is 13", the shoulder width is 23" and the girth is 44". Medium/Wide, measures 56" in length with a wider and roomier fit. This yukata is designed to fit a woman 5' 8" to 6' in height. The sleeve length is 15", the shoulder width is 31" and the girth is 54".